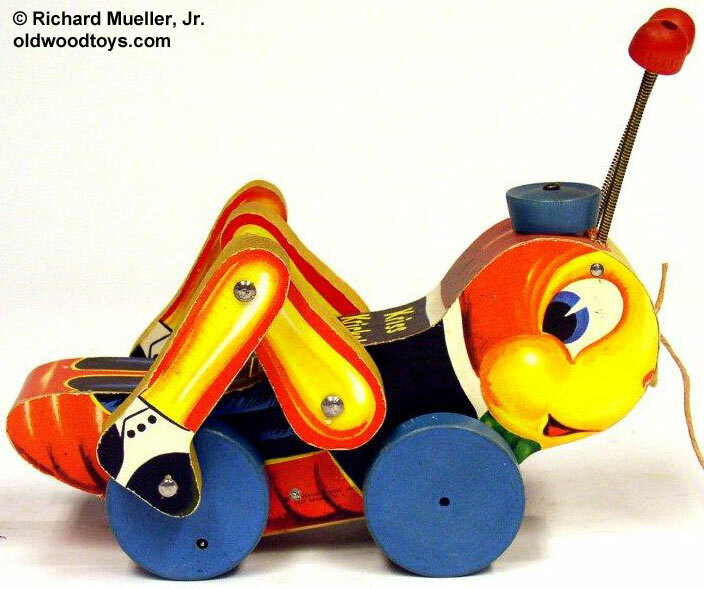 Description: Long before Disney brought bugs to life in their 'Bug's Life' movie, Fisher-Price had brought a cricket to life in their #678 Kriss Kricket. When pulled, Kriss makes a realistic "chirp-chirp" noise while he rolls along in a life-like cricket hop and jump motion that makes his antennas wiggle all around. 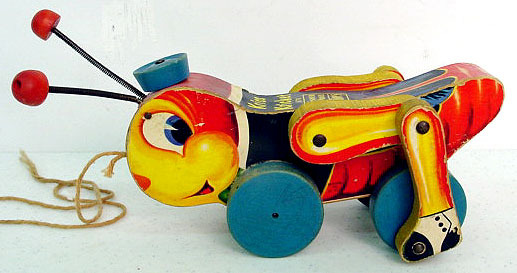 FPT4318 - Kriss Kricket - Wooden cut-out cricket that rolls on 4 blue wooden wheels and has 2 seperate double-jointed wooden cut-out rear legs that are attached to the back 2 wheels. The cricket has paper lithographs on the sides and edges of his body and on the sides of his legs of a yellow and light brown cricket with big blue eyes wearing a black tuxedo jacket. Cricket has a small round blue wooden hat and long spring antennas with red wooden beads on the end. When the cricket is pulled, his legs moves making him hop and jump, his antennas bounce, and he makes a "chirp-chirp" sound. Measures 7-1/2" long, 4-1/4" high, 3-1/2" wide. A company in Mexico called "JP" made a copy of the Kriss Kricket, see lower photo to the left.